CryoSat-2 will be taken into orbit on a Dnepr launch vehicle. 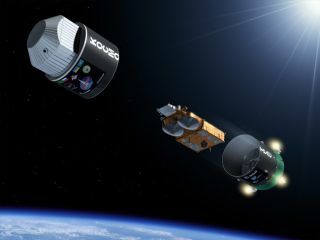 Unusually, the upper stage flies backwards before releasing the satellite, ensuring the most accurate orbit injection. A European satellitebuilt to monitor trends in polar ice will be grounded for up to a week becauseof an issue with the steering system on its Dnepr launcher. The CryoSat 2 satellite was supposed tolaunch Feb. 25 at 1357 GMT (8:57 a.m. EST) on a converted Ukrainian SS-18ballistic missile from an underground silo at the Baikonur Cosmodrome inKazakhstan. In a statement released Friday, the EuropeanSpace Agency blamed the delay on the steering system of the Dnepr rocket'ssecond stage. "Although the fuel supply of the secondstage engine should be sufficient to get CryoSat into orbit, the fuel reserveis not as large as they would like it to be, according to the Ukrainian companyYuzhnoye, who developed and is responsible for the launcher," the ESAstatement said. Engineers are still reviewing the situation,and "measures will be taken to resolve this concern," according toESA. The Dnepr second stage is unmodified from thesystem used on the SS-18 ballistic missile, according to Kosmotras, the jointRussian-Ukrainian company that manages commercial flights of the booster. Mission officials did not announce a newtarget launch date, although the delay is expected to be at least a week. Kosmotraswill inform of ESA of a new date shortly, according to the statement. Shrouded inside the booster's nose cone, the1,587-pound spacecraft was transported to the Dnepr silo on Monday to be boltedto the 111-foot-tall rocket. The $189 million mission will measure theprecise thickness of land and sea ice with an Italiansynthetic aperture radar altimeter system. The instrument will be able todetermine ice thickness with a precision of less than an inch. CryoSat 2 will replace a satellite destroyedin a launch mishap in October 2005. ESAchartered an almost identical spacecraft, added a fewinstrument upgrades, and selected a new rocket to launch the satellite. The craft will circle Earth at an altitude of435 miles, passing over latitudes as high as 88 degrees in the north and southpolar regions. In such an orbit, CryoSat 2 will peer down on Arctic Ocean seaice and land ice sheets covering Antarctica and Greenland. Scientists expect CryoSat 2 will shed lighton how fast ice coverage is diminishing and determine the overall mass of ice,which is critical for predicting sea level rise.